Glorious Leader Screams Betrayal At Harley-Davidson - Joe.My.God. 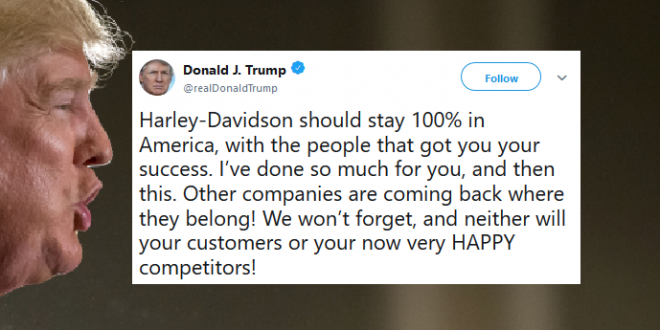 President Donald Trump renewed his attacks on motorcycle brand Harley-Davidson on Wednesday, laying into the company on Twitter. On Monday, Harley announced that it would shift some of its production outside of the US due to Trump’s trade fight with the European Union. Trump’s decision to impose a 25% tariff in steel imports to the US had already hurt Harley’s business. But the announcement of EU tariffs on US-made motorcycles as a response to the steel tariff appears to have been the last straw. While Trump’s policies continually hit the motorcycle company, Harley previously enjoyed a fairly tight relationship with the president. Executives from the company visited the White House in February 2017 and Trump continually brought up Harley as an example of a strong American business. That close bond was broken following Harley’s announcement, prompting Trump to go on a days-long campaign against the iconic company. Harley-Davidson should stay 100% in America, with the people that got you your success. I’ve done so much for you, and then this. Other companies are coming back where they belong! We won’t forget, and neither will your customers or your now very HAPPY competitors!